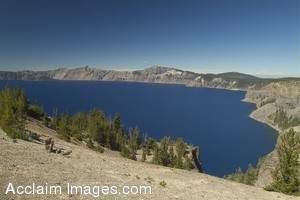 Description: Stock Photo of the Barren Side of Crater Lake. This side of Crater Lake is not often seen. It is the far side and is away from the Lodge. You may purchased this photo as an art print or a poster. You may also license it as stock photography.